“30th Wednesday A fine pleasant winter day, I did my choars was at the office all day & evening came home about 8 ½ & went to bed about 9 ½ nearly sick. “31st Thursday A cold driving snow stormey morning & day & tedious day & night & verry cold. I did my choars was at the office all day, but did not go down in the evening on account of the cold windy snow storm. “January 1st Friday A cold windy morning & snow a flying the most tedious day we have had for years the thermometer stood at from 23 to 25 degrees below zero in morning. I did my choars was at the office all day but not in evening went to bed about 9 nearly sick with a cold. “2nd Saturday a pretty cold day but not as cold as yesterday but the same in morning. I did my choars was at the office all day but not in evening. Went to bed at 9. The cars have been blocked up since Thursday night. “3rd Sunday A cold day but not as cold as yesterday. I did my choars was round the house the most of the day choaring round fixing hen house & stable went to office about noon with I Kenyon & called at Mr Hoyts was at home all the evening choaring & writing & went to bed 8 & 9. “4th Monday A pretty cold day & evening, about 23 degrees below zero. I did my choars was at the office all day & evening came home about 8 ½ & went to bed at 9 ½ sick. “23rd Wednesday A fine pleasant day & a getting warm. I did my choars was at the office all day & evening came home about 8 ½ & went to bed at 9 ½ nearly sick. “24th Thursday A fine pleasant day & evening. I did my choars was at the office all day & evening came home about 8 ½ & went to bed 9 ½ nearly sick. “25th Friday A fine warm pleasant day for Christmas & thawed fast, I did my choars was at the office all day & evening came home at 8 ½ & went to bed 9 ½. Mrs Potter & Charles went to Pelhams to Christmas & went home with Kenyons folks at night to go to Aurora. “26th Saturday A cloudy damp day & mist a little all day & evening thawed fast, I did my choars was at the office all day & evening came home at 8 ½ & went to bed 9 ½. “27th Sunday A cloudy damp disagreeable day & mist all day & evening. I did my choars was at home all day & evening choared round the house & fixed my pork & vinegar churned in evening & wrote some, went to bed between 8 & 9 nearly sick. Mrs Potter came back from Kenyon about 2 oclock. “28th Monday rather disagreeable weather for winter. I did my choars was at the office all day & evening came home about 8 ½ & went to bed about 9 nearly sick. “16th Wednesday a stormy day rained & snow at night. I did my choars was at the office all day & evening came home 8 ½ & went to bed about 9 ½ nearly sick. “17th Thursday A cold snow squalley windy day. A pretty tedious day. I did my choars was at the office all day & evening came home 8 ½ & went to bed about 9 1/2 . [in margin] Rol & Amo Wills got home. “18th Friday A cold winter day nearly a foot of snow on the ground. I did my choars was at the office all day & evening came home about 8 ½ & went to bed about 9 ½. “19th Saturday A cold pleasant day for winter. I did my choars was at the office all day & evening came home at 8 ½ & went to bed at 9 ½ nearly sick. “20th Sunday A cold cloudy & evening. I did my choars was at home all day & evening a choaring round & fixing to kill hogs wrote some in evening & went to bed about 8 ½ about sick. “21st Monday rather fine weather for the season & good sleighing. 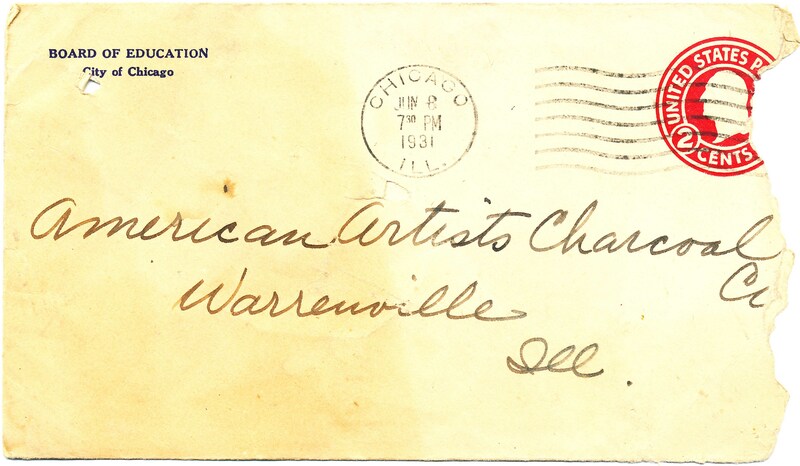 I did my choars was at the office all day & evening came home 8 ½ & went to bed about 9 ½.
Warrenville was home to artist Adam Emory Albright from 1924 until his death in 1957. Our community offered Albright a rural setting, in which he found his inspiration for the country scenes he painted. His twin sons, Ivan and Malvin, who also called Warrenville home for many years, followed in their father’s footsteps taking up art. The three Albright artists used the former Methodist Church, located on Second Street, as an art gallery and studio, known as “The Albright Gallery of Painting and Sculpture.” The Warrenville Historical Society now uses this building as the City’s Museum. During their time in Warrenville, the Albrights had many side businesses in order to supplement their income to support their art. One such business was the American Artists Charcoal Company. Adam was known as a businessman as well as an artist, and traveled to an island in the Mississippi River near Grafton where there was a charcoal manufacturer. During his trip he learned the trade, and when he returned home, he enlisted his sons in helping him found the company in 1928. 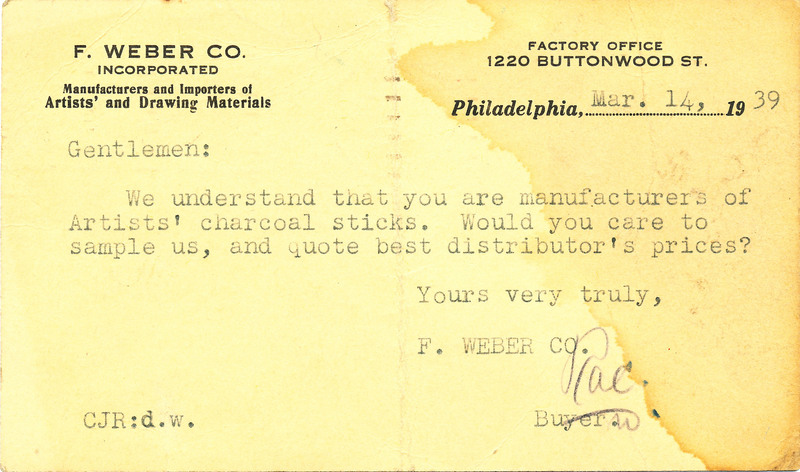 They arranged shipments of the special lumber necessary for production and made charcoal right behind the Albright Studio. Their initial sales campaign consisted of longhand written letters to schools and other prospects. 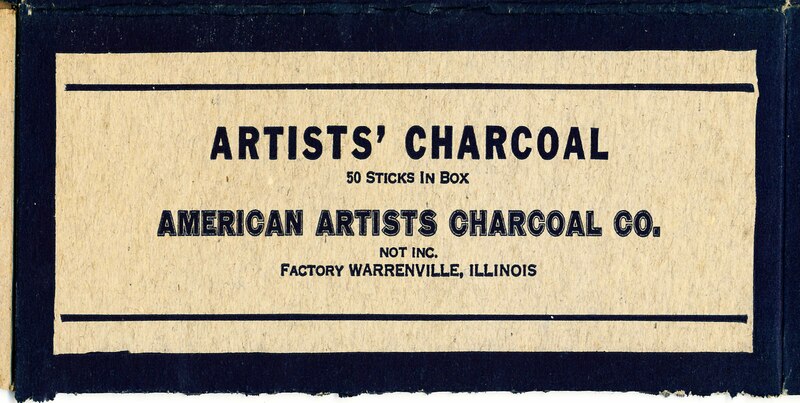 Below are images of items from the Warrenville Historical Society’s collection detailing the charcoal business. Box cover that charcoal was sold in. 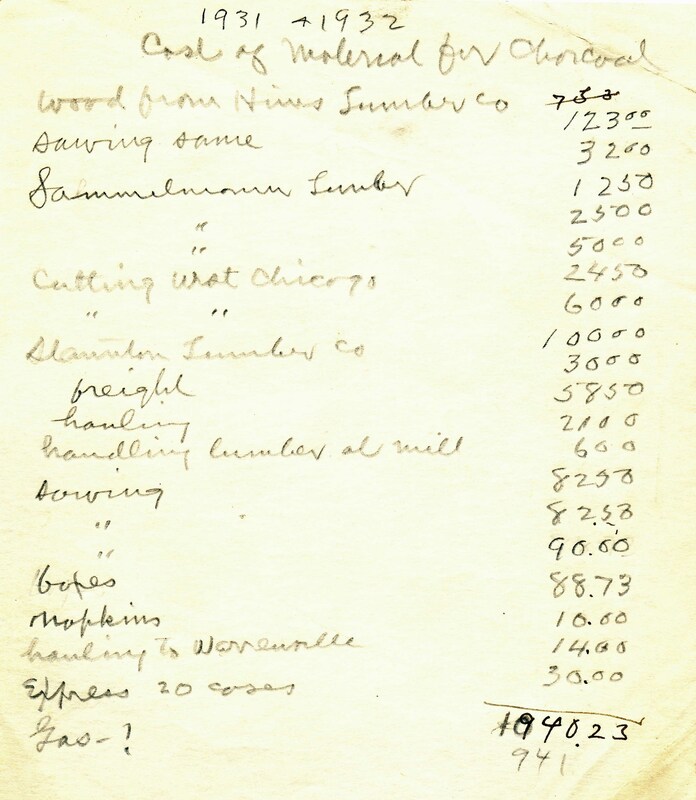 Handwritten note detailing the company expenses for 1931 and 1932. Envelope of an order placed by the City of Chicago’s Board of Education. “9th Wednesday rather fine weather for winter. I did my choars was at the office all day & evening came home about 8 ½ & went to bed about 9 ½ nearly sick. “10th Thursday rather fine weather & warm for the season, I did my choars was at the office all day & evening came home about 8 ½ & went to bed about 9 ½ nearly sick with a cold. “11th Friday fine weather but some cloudy. I did my choars was at the office all day & evening came home about 8 ½ & went to bed about 9 ½ nearly sick with a cold. “12th Saturday A cloudy damp day & rained quite steady during the night, I did my choars, was at the office all day & evening came home a little after 8 by Hoyts & went to bed about 9 nearly sick with a cold, E acted like a fool & made a fool of it. “13th Sunday A cloudy rainey cold day wind in North & North East a tedious day & evening, I did my choars eat breckfust about 9. I went to the store & got a tunnel? Came back by Hoyts & choared round the house & fixed the vinager some cleaned out pig pen etc, went to bed about 8 ½ or 9 about sick. “14th Monday rather fine weather for winter. I did my choars was at the office all day & evening came home about 8 ½ & went to bed about 9 ½ tiard & nearly sick. “2nd Wednesday fine weather for winter. I did my choars was at the office all day & evening came home about 8 ½ & went to bed about 9 ½ nearly sick. “3rd Thursday fine weather for the season. I did my choars was at the office all day & evening came home about 8 ½ & went to bed about 9 ½ nearly sick. “4th Friday A fine day for winter. I did my choars was at the office all day & evening came home about 8 ½ & went to bed about 9 ½ nearly sick. “5th Saturday A fine pleasant spring like day. I did my choars was at the office all day & evening came home about 8 ½ & went to bed about 9 ½ nearly sick. “6th Sunday A most beautiful day & evening, I did my choars was at home the most of the day & evening, went to the store twice after 3 oclock, I choared round the house the most of the day, was at home all the evening & went to bed about 8 or a little after, Caroline came down between 10 & 11, John & Eliza McNelly came between 11 & 12 and went home between 3 & 4, Mrs Potter & Charles went to meeting a little after 10 & got home a little after 3. Mrs Potter had the sick head ache & went to bed, Cal got supper. “7th Monday rather fine weather for winter. I did my choars was at the office all day & evening came home about 8 ½ & went to bed about 9 ½ nearly sick with a cold.